(Toronto, Ont.) The future is now for a promising group of Team Canada hopefuls and Wheelchair Basketball Canada is proud to welcome partner Toyota Canada into the fold with the official start of the 2017-18 training season at the National Academy in Toronto. 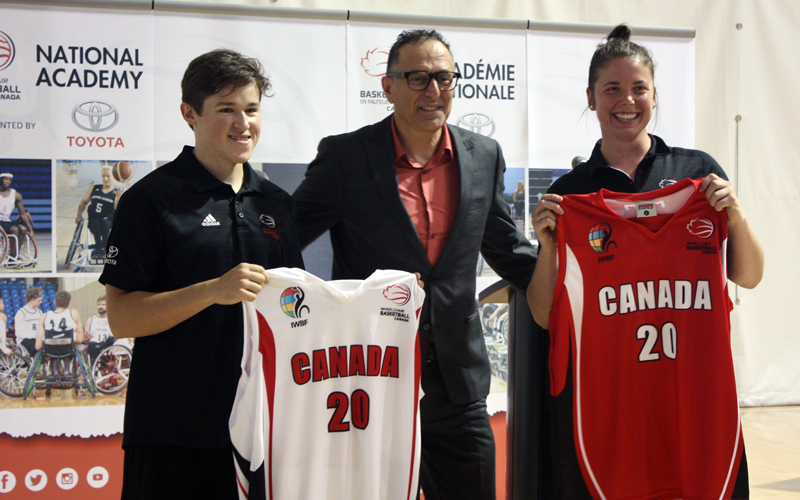 The National Academy, presented by Toyota, is a groundbreaking program designed to accelerate the development of the next generation of elite Canadian wheelchair basketball athletes and fuel Canada’s ongoing podium success at future World Championships and Paralympic Games. The program brings together targeted wheelchair basketball athletes with National Team potential from across Canada and allows them to develop in a central location with access to optimized training, coaching, mentorship and support services. The program is led by National Academy Director and Head Coach Mike Frogley, one of the top minds in the sport. “We commend Toyota and the government and sport partners who share our vision of being a world leader and investing in the future of our sport in Canada while championing a more inclusive society in which everyone can participate and thrive,” said Gittens. The National Academy program is made possible thanks to the support of presenting partner Toyota, as well as the Government of Canada, Own the Podium, the Canadian Paralympic Committee, the Government of Ontario and the Canadian Sport Institute Ontario. The National Academy is a program within the Wheelchair Basketball Canada National Training Centre located at the Toronto Pan Am Sports Centre in Scarborough.